Is Banana Good for Gaining Weight or Losing Weight? Skinny people are often advised to eat lots of bananas with milk. Similarly, if you are on a weight loss diet and if you go to the nutritionist, he/she will advise you to eat at least one banana every day. While some people believe that banana helps in gaining weight, others believe that it helps you to lose weight. So, what do you think? Is banana a fruit for weight loss or gain? Whether banana is a fruit for weight loss or gain depends on how many bananas you eat. 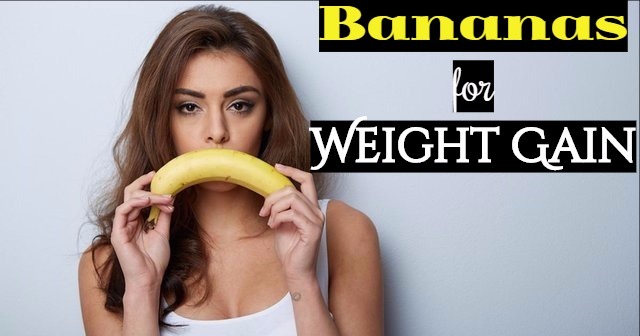 If you eat only bananas and no other food, then you will lose weight very effectively. But if you have your regular meals and eat about 5 to 6 bananas every day, then you will gain weight. Whether you gain or lose weight, eating bananas is good for your health. Ayurveda says that eating one banana daily helps in keeping you away from all diseases. According to ayurveda, banana is great for balancing the vata and pitta doshas. But if it is not digested properly, it can cause an increase in the kapha dosha. Ayurvedic texts explain that banana can balance the three humors i.e. doshas. This way it keeps your body cool. Ayurveda says that anaemic people can increase the haemoglobin count in their blood by consuming banana. A single banana contains 108 calories, which is equal to 18 gm of carbohydrates. Carbohydrates are needed for our body organs to function smoothly. However, if you consume carbohydrates in excess, it may lead to weight gain. Bananas are also rich sources of vitamins, minerals, and fibre. These help in improving the basic metabolic rate i.e. BMR. When the BMR increases, your body tend to lose weight automatically. Usually this weight loss is faster than the normal time required. Banana also contains pectin. This helps in keeping you feeling full for a longer time. The low glycemic index of banana helps in reducing weight. Most of the fruits are not rich in vitamin B6. But bananas are rich in this vitamin. It helps in keeping your body healthy even after an intense workout. According to research made, deficiency of vitamin B5 and folic acid can cause several diseases connected with the heart. So, consuming bananas is an easy way to prevent heart diseases. It is also good for keeping the blood sugar levels under control. Bananas also contain enzymes that help in speeding up the digestive process. This it does so by reducing the amount of time needed by the intestines to digest food. These results in metabolism more suited to losing weight. Bananas are sweet to taste and very delicious. So, our taste buds are also satisfied with the intake of bananas. There a few types of bananas help in losing weight faster. These bananas are also known as baby bananas. They are available in the US. They are short and very rich in Vitamin B6 and fibre. Other types of bananas that are good for losing weight are burro bananas, Cavendish bananas, red bananas and plantain bananas. Bananas are rich in calories. This makes them good for gaining weight. A six-inch banana can provide you about 90 to 95 calories, which is less than the amount of calories that you get after eating a small candy. The best way to include bananas to your regular diet to gain weight is to add it to smoothies and milk shakes and consume them. Being rich in Vitamin B6, they help in maintaining proper circulation of blood in the body. As a result, more and healthy red blood cells are produced in the body. Bananas also help in digestion as they are rich in manganese. It helps in regulating bowel movements and preventing bone diseases. Bananas are also rich in potassium. It helps in maintaining the electrolyte balance in the body. It is also needed for the functioning of nerves and muscles and for the production of energy in the cells. Each large of banana provides approximately 10 % of the potassium you need daily. Most nutritionists say that you have to eat lots of bananas top gain weight. This way the natural sugar in tem is broken down into glucose instantly. This glucose is used to provide energy. The excess glucose is stored as glycogen in the liver ad muscles to be used whenever required. When the glycogen stored exceeds its storage limit, it gets stored as fat. However it is also advised that you should not eat more than 5 to 6 bananas a day as too much of it can lead to constipation and slow down bowel movements. Banana is very delicious and you can consume it in many ways. You can mix banana with other fruits and make fruit salad and consume it. Sprinkle some black salt on bananas and have it. Blend banana with low-fat yogurt and make banana smoothie. You can also cut a banana into slices or smash the banana and add it in your sandwich. How to Make Banana Shake? Add the sliced bananas, milk and ice in a blender and add a scoop of ice cream. Add 4 to 5 almonds. Blend the ingredients till the mixture becomes smooth and a thick juice. Pour it into glasses and add sugar if you need. You can add different flavours and add various dry fruits like raisins, cashews and walnuts. This will enhance the richness and nutritive value of the banana shake.